No they haven't. JJ Trek is not comparable to Star Wars in any meaningful sense. and just what is that trail it leaves behind in Into Darkness? Are they ice crystals? I can't see anything. Did you not type anything or is it just my PC acting funny? Or did you post a youtube video? 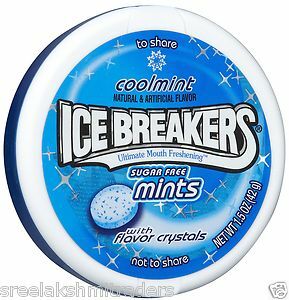 It's a picture of a carton of Ice Breaker mints. Because by extremely rigorous scientific analysis of the particles and associated sound effects in vacuum, I determined the Enterprise's warp drive in Into Darkness is powered by coolmint flavor crystals. y'know, 'cause they're cool. And taste great with Big Red Matter Cinnamon balls. They've thrown all the science out the airlock and into space! In all fairness, Star Trek has always been extremely loose with its science and has been known to break its own rules a time or ten. It was never about science with Trek, it was about a vision of the future, a reflection on the issues we face in our society today that also provided hope for tomorrow. And Star Wars is not about action, it's about storytelling and operatic drama; classic tales of good and evil, heroism and cowardice, triumph and defeat. JJ Trek is not defined by either of the above. It's defined by special effects, absurd set design, absurdly conventional and over-the-top character drama, and absurd amounts of lens flares. In short, mediocrity ad absurdum. Roddenberry tried to use modern scientific knowledge and theoretical science more during the writing of TNG. He wanted to make it as close to reality as possible. Yes, TNG was somewhat more proper on the science than the other series were, but the point remains that scientific accuracy is not a defining characteristic of Star Trek. I hope one day, Space Engine's lifeless planets are just as interesting to explore as ones with Life! That has got to be the most cringe-worthy writing about the presentation of a newly discovered exoplanet I've ever read. Which is a shame, because the planet itself is absolutely fascinating. That has got to be the most cringe-worthy writing about the presentation of a newly discovered exoplanet I've ever read. Which is a shame, because the planet itself is absolutely fascinating. The planet doesn't exist, they made it up. Also, this most certainly did not need its own thread. I didn't say that they weren't parodying a real planet, just that they weren't presenting one. I was wondering what the heck was going on with that -- I recognized the planet's description and discovery method, but not the RS designation. but not the RS designation. Lol, I was just thinking that, too.